London(web team): Exit polls have differed from the opinion polls and looks like David Cameron and Conservatives are returning for second term. What was said to be the most unpredictable elections for the country, UK has astonished political pundits by giving exit polls utterly opposite to the opinion polls. 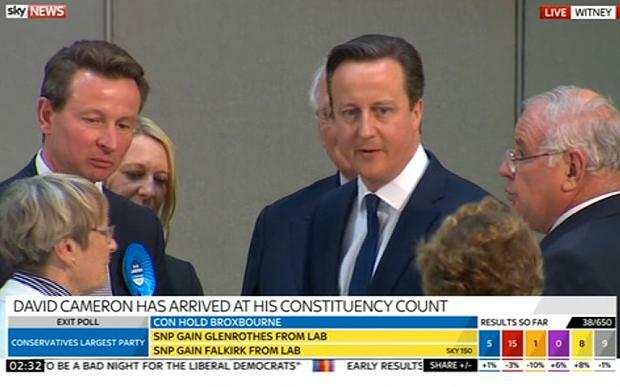 According to these exit polls, David Cameron and Tories are returning to Westminster for their second term. According to Reuters, British Prime Minister David Cameron's Conservatives are on course to win the most seats in parliament but will be just shy of an outright majority. An exit poll showed on Thursday after voting closed in a national election. 10 seats in the 650-seat Westminster parliament, according to the poll, released by UK broadcasters. The combined total of 326 for the Conservatives and Liberal Democrats, who have governed in coalition since 2010, indicated that Cameron should be able to stay in office. On the other hand, Scottish nationalist leader Nicola Sturgeon said an exit poll showing her party winning 58 of Scotland's 59 seats in Britain's national election should be treated with huge caution.